SonicWALL™ Email Compliance and Encryption subscription services work with the SonicWALL Email Security solution to provide organizations of all sizes with a powerful framework for stopping email threats, managing compliance requirements, and providing mobile-ready secure email exchange. 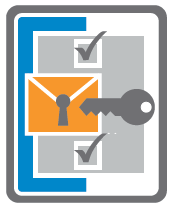 SonicWALL Email Security is available as an appliance, a virtual appliance or Windows Server® software. The solution combines an awardwinning, anti-spam engine with antiphishing, anti-virus, content filtering and policy management. Record ID matching - Searches for predefined social security numbers, bank routing numbers or credit card numbers. An easy-to-use, web-based UI enables custom record searches. Attachment scanning - Looks for content within document attachments, including Word, PowerPoint, PDF and more than 300 other file types to ensure that sensitive data is not distributed. Predefined policies-Set and enforce policies for common compliance setups. Predefined dictionaries - Enable organizations handling health or financial records to monitor for HIPAA, SOX or GLBA violations. When these dictionaries are used in conjunction with Record ID matching, they ensure the protection of confidential information. Approval boxes - Enable the viewing of email that potentially violates compliance policies before allowing it to be distributed outside the organization. Email archiving - Allows for inbound and outbound email archiving on the same server or appliance. Additionally, organizations can route email that matches a specific policy to an external archive. Email Encryption - Securely routes email that matches a specific policy to an integrated, seamless cloud encryption server to ensure the secure exchange of email containing sensitive customer data or confidential information. Compliance reporting - Enables organizations to monitor and report on compliance-related email traffic. The Email Security administrative interface is web-based to enable centralized management. 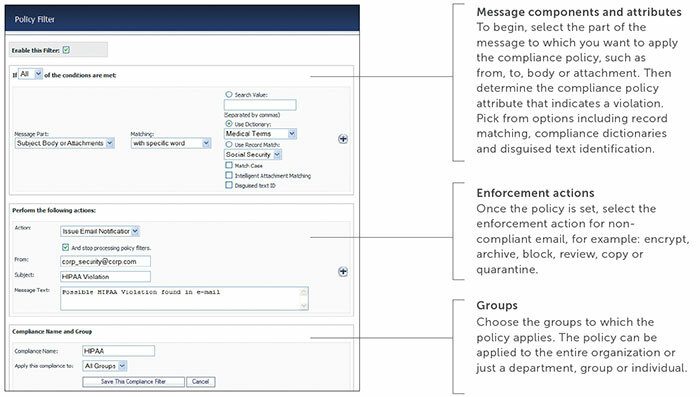 This makes it easy to create inbound and outbound policies for regulatory and corporate compliance on just one screen. Select the component of the email to be searched and the attribute that indicates a policy violation. Determine the enforcement action that should be taken if the attribute is found. Choose the groups to which the policy should be applied. 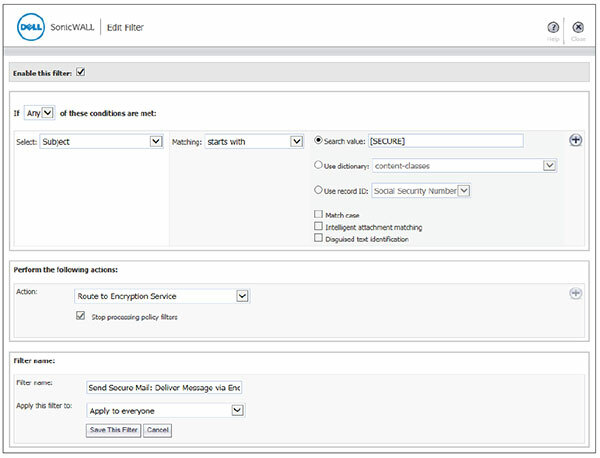 The SonicWALL Email Compliance and Encryption subscription service provides integrated, policy-enforced and on-demand email encryption. With this service, policies may be configured to scan outbound email content and attachments for sensitive data and, if found, securely route sensitive email for encryption and secure exchange with customers and partners. Encrypted email can be tracked to confirm the time of receipt and time opened. A notification email is then delivered to the recipient's inbox with easy-to-follow instructions to log on to a secure portal to read or securely download the email. The service is cloud-based; no additional client software is required. Unlike competitive solutions, SonicWALL subscription services allow encrypted email to be accessed and read from mobile devices and laptops.